Forming cream for flexible hold and serious shine. The range is the invention of Adee Phelan, British Men�s Hairdresser of the year in 2000, and the creator of some of the most iconic men�s hairstyles of the 21st century. 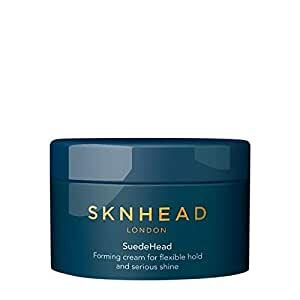 SKNHEAD is the first product range that can be used as a tattoo, beard, face and body moisturiser, and hair styler, all in one product. The concept for the range, currently consisting of seven products, was born back in 1999. Natural benefits of ingredients such as Cacao Seed Butter and Palm Oil, which is rich in Vitamin E, and known for anti-oxidant and anti-ageing properties when used on skin.